One cannot discount mortgage portfolios and not take into consideration the families affected. Both sides must get a Break! FAMILIIES ARE LOSING THEIR HOMES DAILY!! Below is a broad conceptual outline to a solution. We would like to meet and share complete details of what you're about to read. "The Banking System Feels Broken" was written to expose the disconnection between banks, investors, and most importantly, homeowners. Too many high ranking advisors and economists have unfortunately directed banking institutions into a downward spiral. The banking system is not broken in fact the basic key components are still intact. I feel humbled to find myself in a position to submit an overview of a proposal which demonstrates a Viable Modification Solution towards change. American economics welfare needs to be positive and productive. Not only can this plan be put into action immediately with results, it can be measured in less than 30 days. These answers are not complicated or difficult to implement. A friend once said, "If the numbers become too large the solution will be found, simply removing the zeros." Many will argue that the solutions must be created from the top. I contend that it is the understanding of the problem that comes from the top. The remedy will be found by bringing everyone: Bankers, originators, loan officers, real estate agents, processors, credit analysts, asset managers, regional managers, CEOs and government agencies to work to work as a cohesive force. The solutions must be implemented into a new foundation. This cooperative effort will save time, thousands of homeowners and billions of dollars. My name is John M. Navarro. I am bilingual. I have spent the last 20 years working in the mortgage and real estate industry, as well as Finance and Collections. I have serviced and settled accounts for thousands of clients in my career. Through these experiences and recognizing that the enthusiasm for diversification to "Wall Street" has clouded the necessary solutions. I have returned to the basics and developed a variety of solutions to meet the needs of all. The purpose must be shared. The capital must be brought back. The investor's trust must be earned. Finally the condition of disconnection and despair must be eliminated. These changes will affect all Americans and will renew the confidence in Corporate America. My team is ready to demonstrate how effectively we can facilitate a Reconnect Program. Our system re-establishes relations between homeowners, bankers and investors. 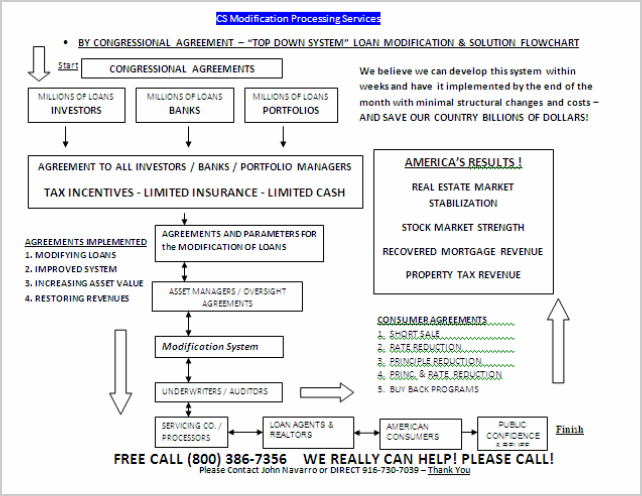 We are simply asking to be given a chance to meet with the top advisors of lenders big or small in order to demonstrate our flow chart as well as the solutions that can facilitate most if not all the mortgage and real estate issues. We offer a resolution for a broad spectrum client base, and additional solutions for the investor on a case by case basis. This process can be performed in minutes using our flow chart and the software that we have created if needed. It saves time; it reestablishes revenues and homeownership, which has been this countries most important objective. We need your help in pursuing this objective. The results will dramatically change and demonstrate a plan that creates relief, stability and brings back the confidence to your banking customers. We can have this system in place within a week's time. As we begin to work together, the positive attention in this industry will make others more aware that better results can be attained. We can begin the healing of this national crisis. I hope that you will join us as we work to restore the hope of all Americans- the Dream of Home Ownership. The system is built on the fundamental concept of one helping another. Together we can rebuild our strong economic community. Let's reinforce and secure the foundation which supports both the American Homeowner and a healthier Corporate America with our experience and knowledge. This is how the process flow chart will work. Final Comment There are many qualified,experienced and unemployed Americans who can at a moments notice be brought into our system to help facilitate our program at a cost of pennies on the dollar. Our housing crisis deserves the attention of a professional team that can make a difference today. Let us bring Americans back to their feet without expending any further congressional time. WE can make it happen...ONE AMERICAN AT A TIME. WE can make it happen...ONE CLIENT AT A TIME. Thank you for taking your time to review and give this brief presentation a chance. Please contact me, we can help! John Navarro at 916-488-5626 or direct 916-730-7039 John@calstaterelo.com I will be available at any time from 8:30am-6:30pm.